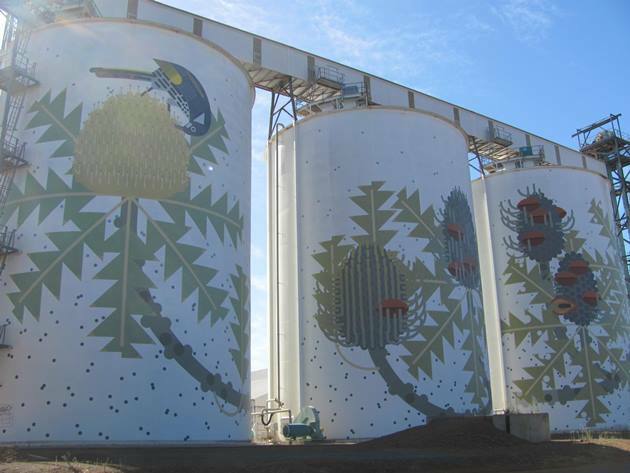 In Western Australia there has been a project running for several years now to beautify grain silos and several have now been painted with native wildlife. It is an ongoing project involving a lot of paint and making grain silos structures to stop and look at in small country towns. There is information on the locations of the grain silos in Northam, Ravensthorpe, Merredin, Katanning, Albany and Newdegate at this website. The artwork in Albany and Newdegate has only just been done this year, but the Ravensthorpe artwork was completed in 2016 and we were able to visit it earlier this year. 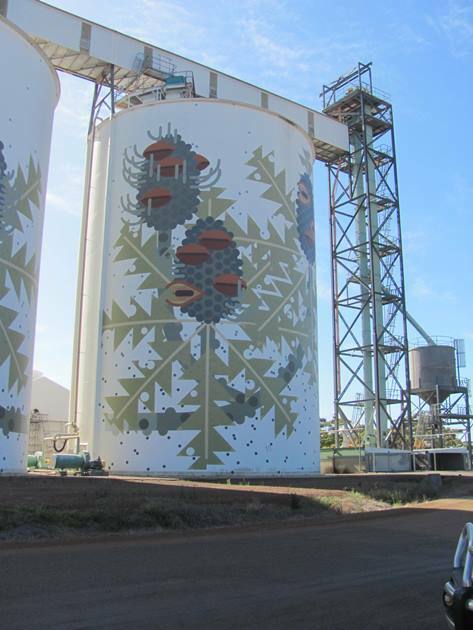 It took 31 days for Amok Island to paint the grain silos in Ravensthorpe and 338 litres of paint. The murals show the six stages of the flowering cycle of the Banksia baxteri, which grows between Albany and Esperance. 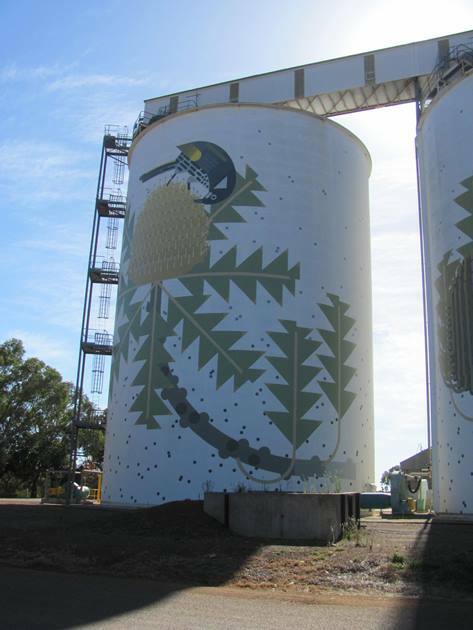 The main pollinators are the Honey Possum and the New Holland Honeyeater and they have both been painted onto the silos. Scrolling down this website you can see all of the stages of painting the artwork and what a spectacular backdrop it has on the edge of Ravensthorpe. 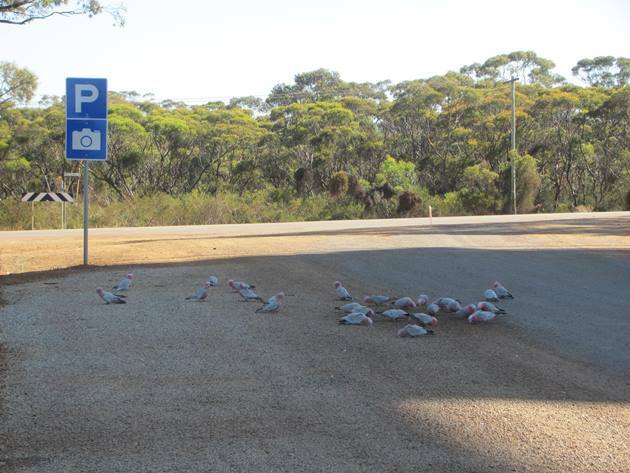 There is a parking bay for you to pull up and take photos of the artwork, which is also a good spot for Galahs to drop in for some food! 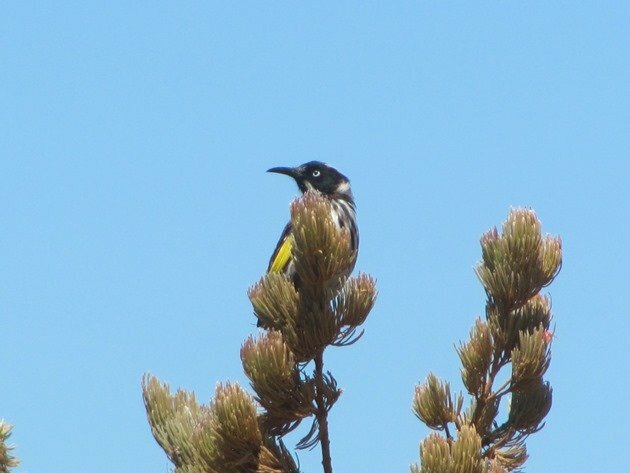 New Holland Honeyeaters are easily found around the area feasting on the nectar of the native plants, but not always easy to photograph! On windy days it makes it even harder to get a complete photo, but I was able to capture a few shots when we were down south earlier this year. As for the Honey Possum in the artwork they are a species that I do not have a photo of! The most recent artwork in Newdegate shows the Malleefowl and hopefully further artwork throughout Western Australia will continue to highlight our unique plants, animals and bird-life. A lot of these small country towns rely on travellers stopping by to help them survive and with the addition of the artwork it is hoped that some people may visit towns that they would not otherwise go to. In Victoria there is a two hundred kilometre silo art trail and there are large scale mural portraits ion each silo to recognise and celebrate the region’s people. 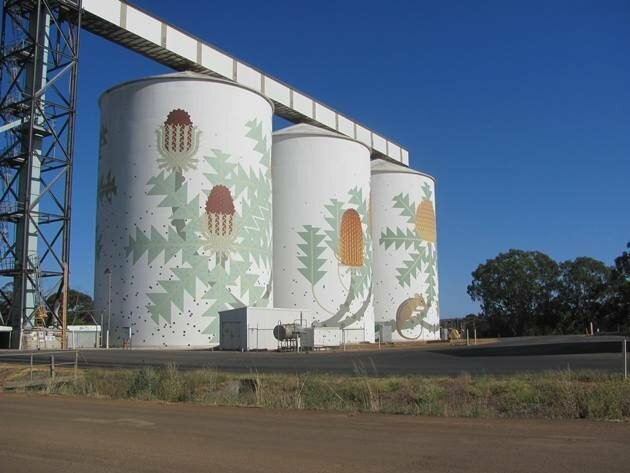 More and more silos are being painted around Australia to put struggling towns on the map and Graincorp is supporting the artwork. Everybody knows there are more birds in the country than in the city, so get out there and enjoy them and drop in at these small country towns and enjoy the artwork on their grain silos! Across Australia many farmers are doing it tough due to drought right now and anybody can help by “buying a bale of hay” or donating their time, a truck or a holiday. A new idea yesterday was to have a “parma for a farmer” and hotels, pubs, eateries and restaurants will donate $1 for each parmy that they sell. So, why not enjoy a chicken parmigiana and help the farmers at the same time! What a great project! 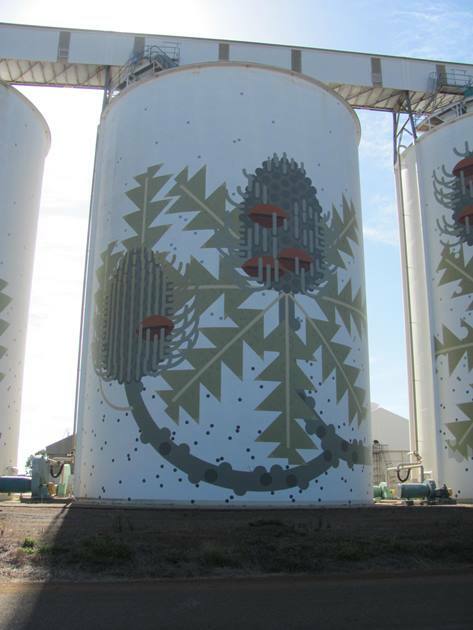 Thank you for photographing these silos, Clare. 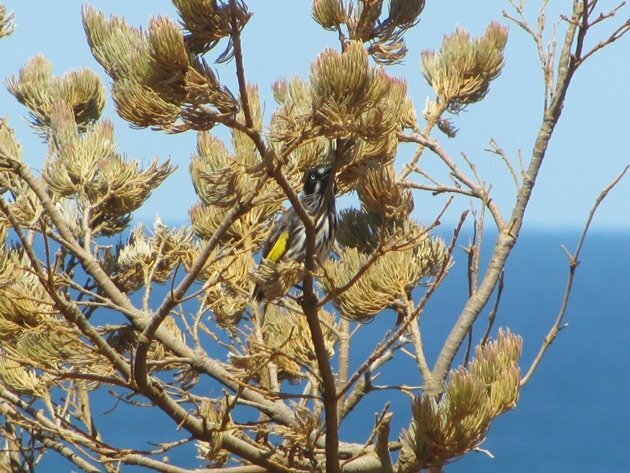 If I ever get to Australia, I hope I’ll be able to go off the beaten path to view them (and the real live birds). I was surprised on my recent trip to North Dakota to see so much art–huge sculptures on the roads and street murals in the city. I wonder if it’s in our nature to celebrate nature in vast open spaces? Another fine example in Western Australia of celebrating nature in vast open spaces is if you take the Tin Horse Highway from Perth to Esperance!